Everything that happens serves a divine purpose and it orchestrated from above. It happens because it destined to happen. There are no co-incidents nor there are mistakes. All that manifest itself in the physical has its origin in spirit. The wheel of life is an endless journey of illumination always rising and falling. It is extremely challenging and yet transformative; at its climax, the moment of bliss is attained through union with the Transcendent Self. In this deeply structured spiritual book, Dr Motsisi takes us through the journey of her life in such an overwhelming way. 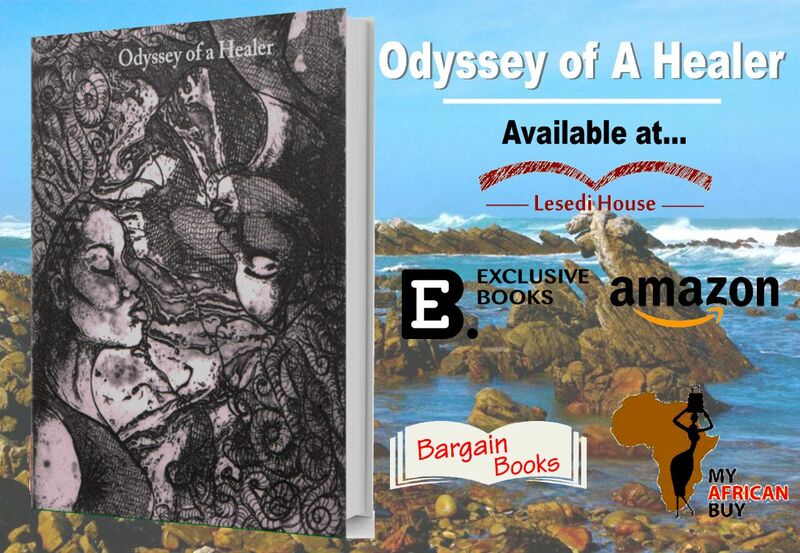 Find the healing of your inner-self carefully hidden in the intricate woven tapestry of the book: Odyssey of a Healer. A seed is useless and important unless it is put in its appropriate matrix. We’re all born or enter this earth plane with a given mission to fulfil. The soul chooses a vessel for operational purposes just like a driver chooses a car. The physical body is the required matrix through which the soul expresses itself. I am reminded of a vision that has always vividly replayed itself both in my dream and wake state and yet I have carried it with me from my early teens and only began to decipher its message in my adulthood. In this vision, many moons had passed when suddenly the high-pitched sound emitted by seashells was overheard drawing all soul beings from different kingdoms to assemble at the sacred shrine for an important announcement. The same seashell trumpet was also used to calm the Spirit of the Sea or summon the Wind Spirit to arouse a turbulent motion in the deep waters for the birthing of new life forms. These acts-achieved in collaboration with nature spirits- were dependent on the sound blown through seashells to either send a message to the Spirit of the Sea or the Wind Spirit. In this great assembly, presided by the hierarchy of elders, keepers of ancient wisdom, the water deities, thanked all their relations from different kingdoms that made up the Cosmos. In unison, they all partook in a sacred ritual ceremony for the consecration of the cohesive silver cord that bound them together into Oneness.After lengthy salutations were made by representatives from each kingdom, the chief elder proclaimed that the moment was ripe for the incarnation of their appointed one into the physical realm. It was revealed that Mother Earth was under a dark cloud during this transitional period. This dense vibration was reportedly draining the keepers of the Earth portals that open to the entire planetary kingdom. There was a great need to assign unlimited number of highly evolved souls to take life forms on Earth in order to serve as midwives during this birthing process that ushers Gaia, Mother Earth into the dawn of another new era. During this transmission, there was the awareness that I had taken life forms in other planets prior visiting Mother Earth. For many generations,in different life forms, I was a participant in contributing to the creative,destructive and preservative forces that interplayed in the life cycle of Earth Mother. It was crystal clear that as a soul being I possessed the ability to keep important memories and talents that formed the essence of my being, and the ability to create life and control the body of life through the lodging of the soul into an object or matter. There existed an awareness that, during the phase, when there was no life in the Universe, the soul being lodged itself in the lifeless objects such as rocks, water, air, etc. I was awakened to the realization that the soul is as old as creation itself, immortal, boundless and timeless. We are spiritual beings having an experience in a physical body, and not the other way round. It is an illusion to believe that the soul needs the physical body for its existence. The soul flows from the Supreme Source, it only chooses an appropriate matrix for its expression in form and fulfilment of its mission as it continues on its upward journey of progression. The body is just a chariot which the soul rides. Its senses, namely, sight, sound, smell,taste are wild horses that pull the body in many different directions. Identifying only with these senses and the perishable body is self-limiting and results in the loss of authenticity that defines us as a multi-dimensional being. A seed is contained in everything that is in a process of continuous change, in a spiral and evolutionary progression. The wheel of life is an endless journey of illumination always rising and falling. It is extremely challenging and yet transformative; at its climax, the moment of bliss is attained through union with the Transcendent Self. The elders have always admonished us that the shedding of old skin is a mandatory process that precedes rebirth and growth. It is worth remembering that to partake on a higher ideal requires letting go of the lesser option, the earthly attachments that derail the explorer. The principle of letting go, known as wu-wei by the Taoist, is a precious virtue in harmony with spiritual growth and enlightenment. Therefore, anything contrary serves the ego which is rooted in fear of the unknown, a hindrance to the spiral progression process. Every new cycle is an opportunity to birth the self-anew through exploration,dreams and self-discovery. During our brief earthly transit, we engage in diverse activities and explorations in various fields of study. The wise soul- using the body as a medium of expression- recollects the scattered pieces of a puzzle because in a way the wholeness of a puzzle is contained in its pieces. The essence of our being is to fulfil the given mandate. Thus, failure to accomplish that is a waste of valuable talent bestowed to us. In a nutshell,this a self-annihilation process that results in the loss of one’s dignity and purpose. When left unchecked it can escalate further, resulting in soul loss while in the world of the living. The created spiritual vacuum as a result of soul loss degrades the individual to a zombie,a descriptive terminology equivalent to a robot in western thought. Let us pause for a moment and revisit the early vision of the seashell trumpet and ponder on the questions that have propelled me on this pilgrimage: Who am I? Why am I here? Where am I going? At a soul level, I am many things in one, a multi-dimensional being briefly transiting the earth plane. I am on an interesting exploration that has rendered me on several accounts speechless and left me in a state of awe. It is a progressive journey of endless discovery. It is sufficiently described by the analogy of the serpent/snake as it undergoes a process of death and rebirth: it sheds off its skin as it outgrows the old. A keen observation of snakes reveals that before it begins to shed its skin, its eyes will begin to cloud over. This gives the snake a trance-like appearance, indicative of its ability to float between the realms of the living and the dead, as it crosses over from life to death and return to life again. [ii]As the skin begins to shed, the opaqueness of the eyes clears allowing optimum vision that provides clarity, thus viewing the world from an entirely a new perspective. [i] Manly P. Hall, The Secret Teaching of all Ages, (New York:Jeremy P. Tarcher,2003) 145. [ii] Ted Andrews, Animal Speak: The Spiritual & Magical Powers of Creatures Great & Small (Llewellyn Publications: Woodbury, 2006), 361. Among the Indigenous people & many spiritual, mystical, esoteric traditions, the direct mode of knowing is achieved through “merging or becoming one with the object of intentionality.” As a healer, mystic and one entrusted with Ancient Wisdom by the Gatekeepers of Knowledge, one harbours a deep rooted belief that Direct Knowing is achieved through embodiment of the experience itself. Becoming one with the experience opens the avenue of compassionate knowing. The partaker of the experience becomes a friend not an intruder. Neither is the experience regarded as the subject nor object. This book is based on my own spiritual journey in search of the true Essence of my being. 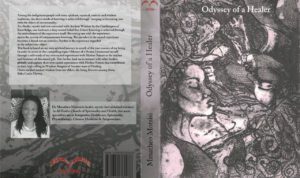 In order to arrive at this compelling topic: “Odyssey of a Healer”, I immersed myself through a self-study of my own sacred experiences with Mother Nature as the Teacher & Bestower of this sacred gift. This further led me to interact with other Healers globally & capture their own sacred experiences with Mother Nature that contributed to their high calling as Wisdom Keepers of Ancient Ways of Healing. Dr Mmatheo Motsisi, born and bred in Soweto, Johannesburg (South Africa). She is healer, mystic and Ordained Minister in All Faiths Church of Spirituality and Health; her main specialities are in Integrative Healthcare, Spirituality, Physiotherapy, Chinese Medicine & Acupuncture. She studied Traditional Chinese Medicine (TCM) & Acupuncture at China Academy of Traditional Chinese Medicine affiliated with University of Beijing.She completed her internship program at Guang Men Hospital (Beijing, China).She also graduated with BSc (Physiotherapy) from University of KwaZulu-Natal (SouthAfrica) and studied Colon Hydrotherapy with RICTAT approved Colon HydrotherapyTraining College. Her passion for natural ways of healing propelled her to study Theology and Alternative / Complementary Medicine with Holos University in Missouri (USA). She has travelled extensively participating in Healing Practices & Rituals of Indigenous People of the World in Nepal, India, China, Africa, including the Native Americans in the USA. 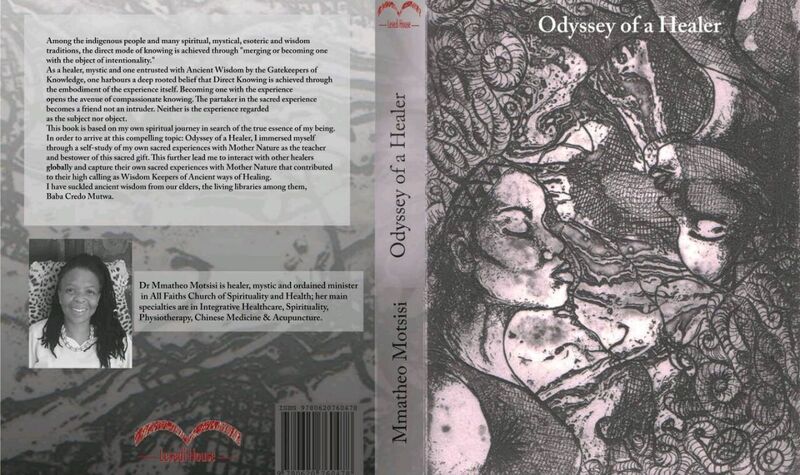 The conception of the book: Odyssey of a Healer was as result of her Unpublished Dissertation on the ‘Healing Power of Nature’ based on her spiritual journey and the experiences of other healers, she has interacted with during her many travels. It was an intense study that spanned over a period of 10 years. She runs her Holistic Practice located in Johannesburg. She has developed a sympathetic understanding of the needs and problems of those entrusted under her care.